"The amendments to the Australian Security Intelligence Organisation Act 1979, which have bestowed unprecedented powers upon the Australian Security Intelligence Organisation (ASIO), are amongst the most concerning of the Howard government's legislative initiatives to counter terrorism." On this page, an article from UTS Reportage, and an interview with human rights lawyer Julian Burnside QC and Mamdouh Habib. As arrests and raids play out across Melbourne and Sydney suburbs, Sandra Fonseca explores in depth what further ASIO legislation could mean for civil rights in Australia. States must ensure that any measure taken to combat terrorism comply with all their obligations under international law, and should adopt such measures in accordance with international law, in particular international human rights, refugee, and humanitarian law. - UNGA, Protection of human rights and fundamental freedoms while countering terrorism (22 March 2004) A/RES/58/187. September 11, 2001 has been heralded as a day which changed the world forever; the birth date of a 'War on Terror', and the impetus for a barrage of draconian legislation which, in the name of national security has put at risk the civil and political rights of all Australians. The amendments to the Australian Security Intelligence Organisation Act 1979 (contained in Schedule III, Division 3 - Click here to read full legislation), which have bestowed unprecedented powers upon the Australian Security Intelligence Organisation (ASIO), are amongst the most concerning of the Howard government's legislative initiatives to counter terrorism. Jenny Hocking in her book, Terror Laws: ASIO, Counter-terrorism and the Threat to Democracy, suggests the amendments are part of a 'second wave' of terrorism related security expansion in Australia, the first being after the Hilton bombing of 1978. "To witness the collapse of the World Trade Centre - brutal, unprecedented and broadcast live - was to be propelled towards reaction. The fear, insecurity and uncertainty, captured on camera and replayed again and again as a cinematic moment to an ever more alarmed public, became part of a seamless rush to action. In this, the inevitable call to arms...a means of gaining control of an otherwise uncontrollable and incomprehensible situation. A tough governmental response was entirely predictable." (Hocking 2004, pg. 1). Four years later, we find ourselves in a climate of insecurity: the contemporary narrative of an insidious, clandestine enemy hiding among us, not at all unlike the cold war paranoia of communist invasion. I'm not sure it's the law that would do it [silence political dissent], it's more the climate that does it. I've been critical, openly critical of aspects of government policy and that's had some consequences for me, I'm self employed and I'm at a stage of my career where I can withstand the consequences of saying unpopular things, but if I were employed somewhere, if I were at the stage of having a mortgage and school fees to pay, I think I'd probably be censoring myself, because most people don't want to end up on the financial scrap heap just because they feel like speaking out about things that are wrong according to their view of the world. The so called terrorism laws are a supplement to this 'climate' and they have received extensive criticism for the stifling effect they will have on Australian's legal rights. Hocking suggests, "Without a doubt the greatest contemporary challenge to relations between the arms of government, and to established civil and political rights, comes from the powerful expansion of security in the name of countering terrorism." (Hocking 2004, p. xi). The amendments have given ASIO the power to detain anybody over the age of 16 who may be able to provide information relating to a terrorism offence, regardless of whether they are themselves suspected of being linked with terrorism. Detention can last up to 7 days, with questioning for a maximum of 48 hours. ...when the police reasonably suspect someone of having committed a crime, they may detain the person for a maximum of 12 hours without charge or for 20 hours in terrorism related cases. It appears excessive that ASIO may detain a person who is not even suspected of having committed a crime for 8 times as long the police. Those detained are obligated to answer all questions and produce 'any record or thing' requested by ASIO, or face a penalty of 5 years imprisonment, the only exception being if they do not have the information, where the onus of proof is on the subject of the warrant. This means that those detained under these laws are denied the common law 'right to silence' - that is the right not to produce information which may incriminate them, as well as the right to be presumed innocent until proven guilty. However, any evidence extracted by ASIO in this manner cannot be used in court. Burnside commented, "It worries me very much that a person who is not suspected of any offence, can be officially disappeared for a week, and be forced under penalty of imprisonment, to answer questions. That strikes me as being seriously anti-democratic." Warrants for individuals can last a maximum of 28 days, after which other warrants can be issued. While warrants are in effect, one is not permitted to disclose details of their experience with anyone other than their approved lawyer or the authorities. When released they cannot explain to their family, employer or the police, where they have been until the warrant is no longer in force. Moreover, the person is not permitted to disclose any 'operational information' (1) for two years, lest they face a penalty of 5 years imprisonment. Meanwhile, the penalty for illegality or impropriety of conduct for officers, is only 2 years. This aspect of the legislation is particularly problematic for freedom of speech. As those subject to mistreatment cannot discuss their experiences it becomes impossible for the media or for anyone else, to expose abuses until they have long since happened, therefore limiting public scrutiny. Moreover, the legislation makes it difficult for journalists to carry out their 'fourth estate' responsibilities as watchdogs over the powerful, and makes the possibility of protecting sources untenable, given that the penalty is 5 years imprisonment. The importance of the media's role in a democracy is debated, but if one is to believe that journalists are indeed the facilitators of a participatory democracy, then these laws will have a serious impact on Australian democracy in the years to come. In their submission, FCLC said, "A system of open and accountable government and government agencies is a prerequisite for true and meaningful democracy. These laws open the door for abuses of power and, of even greater concern, the concealment of these abuses. The secrecy provisions contained in the act are unreasonable in an open, democratic society and should be amended." (2005, Pro-forma submission). ASIO is not required, though it is recommended, to permit those in custody to obtain legal advice prior to questioning or to have a lawyer present. If a person's chosen lawyer is deemed a security risk, they can be refused access to that lawyer. Lawyers are not permitted to interrupt questioning except 'to clarify an obscure question', and if a lawyer is found to be 'disruptive', they may be removed. A lawyer involved only has the right to see the warrant and not to any other information relating to the case. Hence, when a limited role for lawyers is coupled with enforced secrecy, it is apparent that people are put in a very vulnerable position, in terms of their rights. The government ability to proscribe organisations to a 'ban' list, whereby anyone who associates with their members is liable to prosecution has been critiqued as being a violation of our 'freedom of association', which plays an important part in notion of free expression and plurality of ideas in democracy. Hocking identifies similarities between the government's current proscription powers and the Menzies' government attempt to institute the Communist Party Dissolution Act 1950, with the aim of banning the Communist party. The act was considered un-democratic. It failed in a constitutional challenge in the High Court, and was rejected by the public at a referendum. The definition of a 'terrorism act' in the Criminal Code Act 1995 has been described as 'too open', with concern about its potential use in situations of political dissent. While there is a clause, which specifies that advocacy, protest, dissent or industrial action exist outside the definition, this is only so providing there is no intention to cause serious physical harm, death, danger to another's life, or a serious health or safety risk. The difficulty however is in the murkiness of notions of 'intent'. Hocking argues, "...Nor did the qualifier that 'terrorist act' did not include 'lawful advocacy' protest or dissent' provide any relief for these concerns, indicating as it does the obvious corollary that a range of other unlawful actions - for example property damage, charges of assault against police, damage to Commonwealth property at Woomera Detention Centre - occurring during such protests could then come within the strictures of the definition." (Hocking 2004. pg. 201-2). The maximum penalty for committing or engaging in a terrorist act is life imprisonment. In a speech last year Australian High Court Justice, Michael Kirby spoke of the importance of preserving civil liberties despite the threat to security. "Let there be no doubt that the real terrorists are the enemies of civil liberties," Kirby said. He suggested that while it was necessary to respond to the threat of terrorism, a distinction needed to be drawn between 'terrorists' and individuals objecting to injustice. "In his day Mahatma Gandhi was certainly called a terrorist. So was Nelson Mandela," Kirby reminded his audience. Moreover, he argued that in responding to 'violent antagonists', democratic societies had to protect civil liberties as much as possible otherwise, "...the terrorists win. Their attack on civil liberties succeeds when the fundamental principles of a tolerant society, ruled by law, are replaced by excessive state powers and suspension of basic legal rights." Kirby stressed the importance of preserving the fundamental rights of due process, judicial review and civil liberty in anti-terror legislation, even for suspected terrorists. The case of Australian citizen, Mamdouh Habib is one where notions of due process, judicial review and civil liberty have played a small part. Habib was apprehended in Pakistan and accused by the US and Australia of playing a role in the events of September 11. He was imprisoned for more than three years in Guantanamo Bay, without charge, and released in January of this year. He claims he was tortured and treated inhumanely in the prescence of US and Australian officials. Habib's guilt or innocence is a matter for the courts, and yet no charges have been laid. Instead Habib is the subject of continuous surveillance by ASIO. As the Attorney-General said, 'he remains a person of interest' (2). Regardless of Habib's guilt or innocence, the fact that an Australian can be held for 3 years in a foreign prison, with the consent of the Australian government, only to be released without charge, seems a gross injustice - a most undemocratic event. To this day, Habib has not been charged and he is currently mounting a defamation lawsuit against The Australian and the Daily Telegraph newspapers. Habib describes ASIO's treatment upon his return; "I've been treated worse that I was in Cuba, psychologically. They take my rubbish bin, they leave my house open, they break my car open. It's stressful; they're driving me crazy. I was in Cuba just thinking about my breakfast and dinner, if I get it. Now I have to worry about my boys, my daughter, my wife and what they're going to do to them next. With the ASIO laws they can take my son or my wife anytime." (Click here to read full interview). "It was never necessary that new legislation was required. The political arguments at the time said that the attacks on New York in September 2001 changed the world; well of course they didn't really. What happened was that something that had applied in lots of other countries for many many years had all of a sudden occurred in the centre of the empire." Anderson claims that the government's amendments have been a 'political project', as the necessary investigative powers, and legislation outlawing terrorism were already in place. Anderson argues that more resources for ASIO have also been unnecessary, citing the CIA as an example - despite being world's largest and best-funded intelligence organisation it was unsuccessful in preventing attack. Anderson believes that in fighting tooth-and-nail to get the amendments through both houses of Parliament, "the Howard administration was essentially tipping its cap to the US needs at the time." The Hilton bombing case served as a justification for security expansion. Anderson links his past experience to the present situation in Australia, suggesting that today as in the past terrorism has become a pretext for a possibly unnecessary security expansion; "In fact what they said at the time was that the world had changed. That we had been free from terrorism until now, suddenly in 1978 terrorism came along." (Personal interview 18/05/05). Daryl Williams, Attorney-General at the time of the bill's passage, claimed that the new powers were vital. In a media release from his department Williams said, "ASIO will now get the tools it needs to identify and, more importantly, prevent planned terrorist attacks in Australia. This is a significant win for the safety and security of the Australian community". Williams also argued that the bill contained a 'comprehensive set of safeguards against abuse'. Such safeguards include the fact that the Director-General must seek the consent of the Attorney-General when seeking a warrant for an individual from an issuing authority (usually a judge). Moreover, individuals under a questioning or detention warrant must be brought before a prescribed authority (also usually a judge) at the commencement of proceedings. The Inspector-General (IGIS) or his representatives can also be present at questioning to ensure the propriety of conduct. Individuals can also make complaints to IGIS, the Ombudsman or 'seek remedy' from the Federal Court. "I don't think the safeguards are adequate because if you exclude or qualify the use of lawyers, then the potential for the misuse of power is increased. We've seen in other circumstances that the law enforcement authorities can make mistakes, and they can get a mistaken idea of what's going on and pursue theories that turn out to be ill-founded." Tim Anderson is familiar with such a scenario. He and friends Paul Alister and Ross Dunn endured seven years imprisonment after an alleged framing by members of the NSW Police Special Branch. They were released from Long Bay Prison in 1985 after a 'pardon', when doubts arose about the evidence used in their conviction, in relation to the Hilton bombing. In the court case, Special Branch investigators were able to keep intelligence private, using the clause in Australian freedom of information laws which prevents the release to the public of documents relating to ASIO. The claim that ASIO had been privy to their information, proved untrue in hindsight, but as a result 3 innocent men were jailed, and the officers involved have never been brought to justice. This case illustrates the danger of regimes of secrecy. When the activities of governments and the authorities are not open to public scrutiny, the likelihood of incidents of corruption, inaccuracy of information, misuse of power and violations of civil rights is dramatically increased. As these cases show, sometimes the authorities get it wrong, and when the right of the public to hold the powerful accountable for their mistakes is removed by secrecy, the quality of our democracy suffers. In the current legislative framework there is a sunset clause, whereby division 3 must be re-enacted in July 2006 by Parliament in order to remain. A review process is underway in the form of an inquiry by the Parliamentary Joint Committee (PJC) on ASIO, ASIS and DSD, into ASIO's questioning and detention powers . At the hearing of May 19 Dennis Richardson the outgoing Director-General of ASIO, called for the powers to be extended and for the sunset clause to be lifted. The Hon. John von Doussa, QC and President of the Human Rights and Equal Opportunity Commission speaking at the May 20 Session of the PJC argued against the exclusion of a sunset clause in a future re-enactment. "Up to now, the legislation has been sparingly used, and the Attorney-General's Department comment that it has been used carefully and judicially. But there is always the risk that under different management we could see the extreme measures which are contained in the act being more aggressively used," he said . He also suggested that the amendments "potentially offend a number of articles in the ICCPR"(International Covenant on Civil and Political Rights), particularly number 9 (the right not to be arbitrarily detained) as well as the Convention on the Rights of the Child. 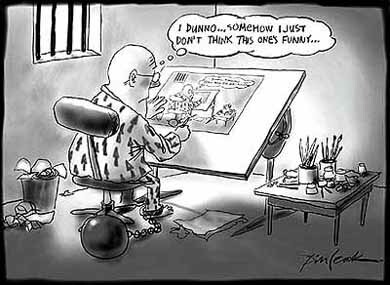 The amendments to the ASIO Act may have had a 'chilling effect' on the exercise of freedom of expression in our society, particularly on the media and on public debate. Moreover, the legislation comprimises many of the civil and political rights associated with a thriving democracy, some of which are outlined in the International Covenant on Civil and Political Rights, to which Australia is a signatory. Such rights include, the right not to be arbitrarily detained, the right of freedom of association and the right to be legally represented. While government's are obliged to ensure the safety of citizens, it makes little sense to do so by compromising civil rights. Once again Hocking makes a significant point, "As governments erode established procedures, the lawlessness of terrorism is being met with the lawlessness of counter-terrorism, such that each becomes a grotesque mimetic reflection of the other." (Hocking 2004, p. xii). 1. Meaning any information, source or 'an operational capability, method or plan of the Organisation'. 2. AAP. 2005. Mamdouh Habib free to meet with family: Ruddock, 28 January, Australian Associated Press General News. Australian Associated Press Pty Ltd.
United Nations General Assembly (UNGA), 2004. Protection of human rights and fundamental freedoms while countering terrorism. A/RES/58/187. 22 March. [online] Available from: UN Action Against Terrorism: Action by the General Assembly. Starick, P. 2003. No one safe from Terror - Howard. Adelaide Advertiser, 2 July. Hocking, J. 2004. Terror Laws: ASIO, Counter-Terrorism and the threat to Democracy. Sydney; University of NSW Press. Anderson, T. 1985. Free Alister, Dunn and Anderson: The Ananda Marga Conspiracy Case. Sydney; Wild & Woolley Pty. Limited. UTSCLC, 2005. Be Informed. Sydney; University of Technology Sydney Community Law Centre. FCLC. 2005. Pro-forma Submission. [online] Available from: The Civil Rights Network. Kirby, M. 2004. "Terrorism: Keeping Calm" [speech/online] Available from: The NSW Council for Civil Liberties. Julian Burnside QC speaks to Sandra Fonseca on freedom of expression and restriction of rights in ASIO legislation. Sandra Fonseca: What would you say is the current climate of freedom of expression in Australia? Julian Burnside: The current climate of freedom of expression I think is relatively good. It is possible to say things that are unpopular, which can be said without undue risk. Sandra Fonseca: How do you feel about the amendments to the ASIO Act? Julian Burnside: It worries me very much that a person who is not suspected of any offence, can be officially disappeared for a week, and be forced under penalty of imprisonment, to answer questions. That strikes me as being seriously anti-democratic. Sandra Fonseca: Do you think this legislation was necessary? Julian Burnside: No, I have never seen any compelling argument that suggests that it is necessary. The 2002 Amendments were a response to the attack on America in September 2001. It has since been revealed that the attack on America was not the result of inadequate information gathering, but rather on inadequate intelligence processing. And what the government in Australia has done, and in America, is to increase the powers of government to gather intelligence. Now it strikes me as quite wrong to so grossly expand the powers of ASIO to gather intelligence, when no plausible case has been made out that they need even greater intelligence gathering powers. And in particular that is so when increased intelligence gathering powers include the right to arrest and detain people who are not suspected of any offence. Sandra Fonseca: What is your opinion of the limited role it gives to lawyers in acting for people under these detention warrants? Julian Burnside: Well obviously I think that's also a problem. The initial proposal was more draconian than the proposal that was finally enacted, but it seems to me that if you accept the importance of the rule of law, then it is highly desirable that lawyers should be permitted into the process by which innocent people are forced to give evidence. I can understand that in some circumstances it may be necessary to say that some lawyers may, in effect, represent an unacceptable risk to the integrity of the process. But that should be exceptional rather than the prevailing assumption. Sandra Fonseca: It has been said that the aspects relating to secrecy in the legislation are problematic for notions of open government and public scrutiny. What is your opinion? Julian Burnside: There is always a tension with intelligence gathering. It's not a thing that can happen out in the open because that's inconsistent with the process itself. It's a matter of striking a balance; I think balance has gone too far in one direction. The point about it is of course, that it is ostensibly for the purpose of protecting democracy but it involves I think a fairly severe compromise of some basic democratic principles in the process. Sandra Fonseca: Do you believe the safeguards in the legislation are sufficient to ensure that the subjects of these warrants right's are protected? Do these safeguards ensure that corruption or misuses of power don't occur? Julian Burnside: I don't think the safeguards are adequate because if you exclude or qualify the use of lawyers, then the potential for the misuse of power is increased. We've seen in other circumstances that the law enforcement authorities can make mistakes, and they can get a mistaken idea of what's going on and pursue theories that turn out to be ill-founded. It worries me considerably to think that a person can disappear from the community for a week or possibly more and on release have no opportunity of explaining where they've been or why they've been held. They run the risk of being jailed if they don't cooperate with the authorities in that time. Being able to do that to innocent people who have not been suspected of any offence, strikes me as appalling. The idea of hidden search warrants I think is very dangerous, being able to execute a warrant without telling the recipient of the warrant that your doing it, means that the Court's oversight of the process is not capable of being invoked in cases of abuse, because by definition the subject of the warrant wont know when the powers have been abused. Sandra Fonseca: There has been much debate recently about the sunset clause in the legislation and whether it should be retained, or the legislation made permanent. Do you believe there is a justification for making ASIO's current powers permanent? Sandra Fonseca: Do you want to expand on that at all? Julian Burnside: Well we are talking about unprecedented powers being used in circumstances, or being conferred and used in circumstances where no case has been made out to justify those powers. It surely can't do any harm to have the nature, extent and operation of those powers reviewed by imposing a sunset period. If, when the sunset period expires, there is a plausible case for renewing the powers then that can be done. To make them permanent now is to assume the validity of the argument, which has never yet been made. The argument, which, supposedly justifies the grant of powers in the first place. Sandra Fonseca: It has been said that these laws would not be out of place in a dictatorship. Are you concerned? In your mind are these laws prejudicial to democracy? Julian Burnside: Yes, I think they are inconsistent with democracy, they are inconsistent with the presumption of innocence, they are inconsistent with the basic democratic freedoms that we've all taken for granted. I mean, at the risk of beating the same drum too often, the idea that a person can disappear without explanation, for a week or more, fills me with real concern. And I think most people if they understood it would be concerned, unfortunately when the measures were being introduced the public debate seemed to focus, at least in the press, on the proposition that ASIO has to have powers to interrogate suspects, well yeah sure, but they have got those powers already. It's about interrogating people who aren't suspects and taking those people out of circulation. In circumstances where their disappearance can never be explained I think that's really a very frightening prospect. Sandra Fonseca: Do you think the aspects of secrecy and restriction of our rights will have an impact on the climate of freedom of expression in this country? Julian Burnside: It might, it depends on how it plays out, well an obvious impact on the freedom of expression will be people who are caught within the net of the widened ASIO powers will not be able to speak about it, and so some fairly nasty things will be going on which cant be the subject of discussion. I'm aware of the case of the book by Andrew Wilkie, which caused a bit of a kerfuffle in the publishers house, because the publishers sent the manuscript of the book to a barrister for a legal opinion, the barrister then turned over the manuscript to the authorities, and the authorities ended up going to the publisher's premises and installing a team of people who then scoured the computers to delete every trace of every sentence which they thought might compromise national security. That's a fairly chilling influence on freedom of expression I think. This has been written about by Robert Manne who was involved in it, and the publishing house was Black Ink or a Schwartz enterprise. You only need that sort of thing to happen once or twice, and people will tend to curb the way they express themselves for fear of getting the same sort of treatment. Sandra Fonseca: Do you think these sorts of laws could ever be used in the future to silence political dissent, hypothetically? Julian Burnside: My immediate response is no, because that's just not the way things are in Australia, but then a lot of things happening at the moment isn't the way things have been in Australia, so I guess I can't rest on that assumption. Its clearly possible but I'm not sure it's the law that would do it, its more the climate that does it. The ABC is a fairly good example of what Terry Lane has referred to as the "pre-emptive buckle". Without anyone bringing any pressure to bear the people in the ABC, tend to err on the side of caution rather than cop a spray afterwards. There are some exceptions of course, but self-censorship in the public sector and certainly in the commercial sector is serious risk. I've often reflected on this in the past few years, I've been critical, openly critical of aspects of government policy and that's had some consequences for me, I'm self employed and I'm at a stage of my career where I can withstand the consequences of saying unpopular things, but if I were employed somewhere if I were at the stage of having a mortgage and school fees to pay, I think I'd probably be censoring myself, because most people don't want to end up on the financial scrap heap just because they feel like speaking out about things that are wrong according to their view of the world. Our self-censorship is a real risk and when you have a climate that discourages open debate, a climate where the mainstream tabloid commentators attack ferociously anyone who contradicts the government line. That's a recipe for suppression of free expression generally and of course it's not the laws that say you can't say 'x' it's the climate which makes it suicidal to say 'x'. Sandra Fonseca: If these laws are made permanent, in the future, under a different kind of government, do you think the possibilities exist for political dissent to be silenced with these laws, particularly within this climate of secrecy? Julian Burnside: Well, when we have a climate of secrecy, there are a couple of different aspects. The climate of secrecy inhibits availability of the basic facts, in where the government or commerce has the facts. That's a little difficult to circumvent and the law doesn't, I mean the Whistleblower Legislation provides some protection there, but it's really the climate I think that is the problem. I'm really amazed that how vehemently I have been attacked for things that struck me as self evident and perfectly available moral positions but as soon as you express those views you get Gerard Anderson and Andrew Bolt down your throat, and because they command much more airspace than I ever will, their view ends up prevailing and other people learn the lesson that if you speak out you'll be attacked, and what's the point of that? If you make yourself unpopular then won't your employer tap you on the shoulder and say 'look here old chap best to keep quiet about these things'? That's the great threat I think; censorship which is official will immediately be attacked and criticized by anyone who is concerned with basic civil liberties. Censorship which is a sort of voluntary, self imposed response to reading the way things are, is much more difficult to attack and is much more insidious. Mamdouh Habib speaks to Sandra Fonseca about the government, ASIO and wanting to be left alone. Transcript of interview with Mamdouh Habib with his wife Maha present. Sandra Fonseca: What is your personal opinion of the power given to ASIO by a law, which permits the detention of an innocent person for 7 days? Mamdouh Habib: I believe it is very wrong to do that. Very very wrong. They shouldn't have this power if this is a democratic country. Sandra Fonseca: Do you think ASIO is an organisation we can trust? Mamdouh Habib: No way. ASIO doesn't work for Australia they work for their own interests. Sandra Fonseca: Do you have any faith in the Australian legal system to protect people's rights? Mamdouh Habib: That's what I am waiting for and my hoping. Maha (Mamdouh's wife): The past three and a half years where was the legal system to protect my husbands rights? Sandra Fonseca: What is your opinion of the Australian government? Mamdouh Habib: They're selfish. They're serving themselves. Sandra Fonseca: What is your view of the Australian government's relationship with the US Administration? Mamdouh Habib: Friendship. Favours. Using the public for their own benefit. They don't care about humanity, only they're own pockets, and as they told me they have very heavy deep pockets. They said they've spent millions to put me under surveillance from ASIO so they can watch me stay home in my bedroom, and harassing my family and my kids, and breach my personal privacy. Sandra Fonseca: How have you been treated upon your return to Australia by the Australian government? By the law? Mamdouh Habib: I've been treated worse than I was in Cuba, psychologically. They take my rubbish bin, they leave my house open, they break my car open. It's stressful they're driving me crazy. I was in Cuba just thinking about my breakfast and dinner...if I get it. Now I have to worry about my boys, my daughters, my wife and what they're going to do to them next. With the ASIO law they can take my son anytime, or my wife. Sandra Fonseca: After your experience what are your hopes for the future? What do you want to happen? Mamdouh Habib: All I'm asking for as a human being and an Australian citizen is to be left alone, peacefully, without harassment, and to have my rights, and live safely with my family. Sandra Fonseca: Do you believe we have freedom of expression in Australia? Mamdouh Habib: Yes we have freedom to talk, but afterwards they'll search your house and they're not going to leave you alone all your life. Is that freedom of expression? Sandra Fonseca: Is there anything else you would like to say? Mamdouh Habib: I want people to wake up and go back to what Australia is, a peaceful country. There has never been an attack on Australia, its just rumours to keep ASIO running his business and keep they're power and deep heavy pockets, which isn't theirs, it's tax payers money - they flew me in on private plane with the Attorney-General. They wanted to me to come back to Australia handcuffed and shackled even though I haven't been charged, to make me look bad to the public but thank God it didn't happen due to the protest my lawyer, Joe McGulus, made. I'm really grateful that the public is on my side. I have a lot of support from the public and I wish I could have a way to speak to each person in the public to let them know how much I appreciate they're support during my being away from Australia and when I came back. Last a message to the public. What happened to me could happen to anybody and when my story comes out in full then they will realise that every person in Australia is in danger.